Join us for local favorites from the European Alps. Fireside Dining at Empire Canyon Lodge features four courses served from our stone fireplaces. Enjoy warm Swiss raclette cheese, cured meats, salads, specialty entrees, hearty sides, fire-roasted leg of lamb, fresh baked breads and dessert fondues. A full bar is available, as well as specially selected wines and imported beer to complement our cuisine. Horse-drawn sleigh rides are available for hire or consider an adventurous trek before dinner on snowshoes. Located in the heart of Deer Valley at the Empire Canyon Lodge. 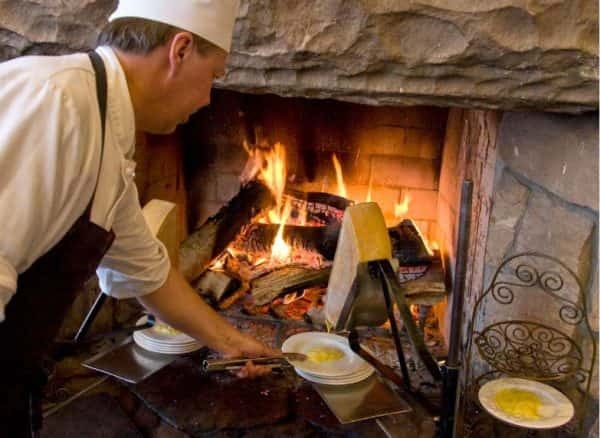 Located in the heart of Deer Valley, Fireside dining offers local favorites from the European Alps and features four courses served from our five stone fireplaces. Open Wednesday through Saturday evenings from 6 to 9 p.m. Visit one fireplace to find our first course of warm Swiss raclette cheese accompanied by steamed new potatoes, house marinated pearl onions, cornichons, cured Italian and Swiss meats, freshly baked baguettes and condiments including house-made mustards and chutneys. Continue to the next fireplace for simmering stews and fricassées made with hearty alpine ingredients such as veal, venison, chicken, beef short ribs, quail, wild mushrooms, leeks, roasted tomatoes, root vegetables and fresh herbs. Served with these, are our hand-grated, crisp, buttery potato rösti - a Swiss staple. Here, also find our field green salad tossed with a champagne red onion vinaigrette and served with homemade ciabatta bread. Another fireplace serves leg of lamb, roasted slowly by the fire, brushed with fresh herbs and seasoning, accompanied by Dutch oven specialties, polenta or three onion risotto. At our dessert fireplace, tempt yourself with chocolate, caramel and white chocolate Grand Marnier fondues. Dipping choices include strawberries, bananas, apples, dried apricots, cinnamon pound cake and almond biscotti. A full bar and a fine selection of wines are available as well as specially selected wines and imported beers to complement each course.